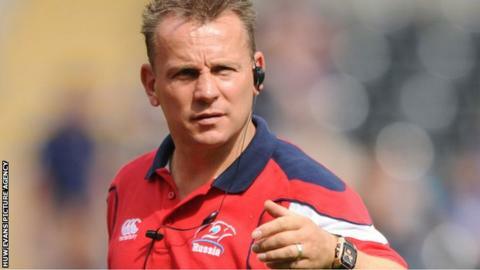 Dragons assistant coach Kingsley Jones believes Welsh rugby has to get used to losing players to France because there is not enough money to stem the flow. Wales lock Ian Evans will join Toulon next season, while Scarlets centre Jonathan Davies is moving to Clermont. Dan Lydiate, Jamie Roberts, Mike Phillips, James Hook and Luke Charteris already play in the Top 14. "We ain't got the finances to compete with France and the sooner we come to terms with it the better," said Jones. "Ultimately there's not a lot we can do about it, we just talk about it a lot. "We talk about central contracts, [but] we [Welsh rugby] ain't going to be pay 20 players half a million quid for central contracts - and these are the figures we're talking about. "Plus, for some peoples' circumstances it's a life choice. "If you're 28 and you get offered four years in Toulouse or Toulon people might want to take that option and it's unfortunate but it's a part of life and I think it'll go on for a long time." The Newport-based region bucked the trend by securing Wales number eight Toby Faletau on a long-term contract in the summer. And Jones, who is also head coach of the Russian national team, believes the circumstances for Wales are better today than when the sport was amateur. "The positive is it's not like in the 1980s and 90s when they were all going to play rugby league and they can no longer play rugby union. "They can [still] play rugby for Wales, [and] they'll be better players. "Ian Evans particularly will be a better player and a better person for that experience. "Yes, internationally we want them in camp much more but a lot of these boys have got the opportunities in their contracts to be released. Jones also believes that talk of the French domestic game being unsustainable were unfounded, in his opinion. "Believe me it is," he warned. "The sponsorship comes from everywhere, the principal, the council, the owners - and there's the crowds. "I went to watch Toulon v La Rochelle a few years ago on a Tuesday night and I couldn't get in the place. "Everyone's got a Toulon jersey on and so that's the way it is and that's the way it's going to remain."